RMS level of the additive Gaussian noise. A Boolean that controls the reseeding of the noise sample generator after the first call of the node. True Accepts a new seed and begins producing noise samples based on seed. False Maintains the initial internal seed state and resumes producing noise samples as a continuation of the previous noise sequence. An array in which each element is a single tone amplitude. The size of this array must match the size of the tone frequencies array and the size of the tone phases array. An array in which each element is a single tone frequency. The size of this array must match the size of the tone amplitudes array and the size of the tone phases array. An array in which each element is a single tone phase in degrees. The size of this array must match the size of the tone frequencies array and the size of the tone amplitudes array. Number that this node uses to initialize the noise generator. This node initializes the noise generator using seed if reset is True or if this is the first call of the node. seed is greater than 0 Generates noise samples based on the seed value. seed is less than or equal to 0 For the first call, this node generates a random seed value and produces noise samples based on that seed value. 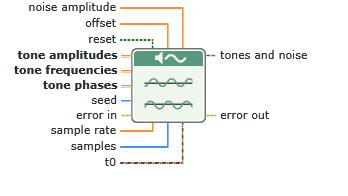 For subsequent calls to the node, if seed remains less than or equal to 0, the node maintains the initial internal seed state and produces noise samples as a continuation of the initial noise sequence. Sampling rate in samples per second. This output returns a waveform or an array of double-precision, floating-point numbers.